There are only 30 veterinary schools accredited by the American Veterinary Medical Association in the U.S. and admissions are highly competitive. Getting into vet school certainly isn't easy, but you can greatly increase your chances of acceptance by achieving good grades, gaining varied experience, and carefully crafting your application package. Applying with a 4.0-grade point average is every applicant's goal, but it often doesn't end up being the reality. Don't give up if you don't have a perfect average. Generally, most schools look for at least a 3.0-grade point average; straight A's are not mandatory. Many students can get in with a grade point average in the 3.5 to 3.9 range if they have a combination of great practical experience and solid recommendations. Holding positions of leadership in college organizations is also a big plus for your application. Gaining varied animal experience is critical. You need to be able to document as many hours of experience as possible working in both large and small animal veterinary clinics. You will likely start out doing very basic work as a kennel assistant and work your way up to assisting with procedures and treatments as a veterinary assistant. Also be sure to document additional experience working or volunteering at zoos, stables, wildlife rescues, and animal shelters. Don't overlook improving your communication and leadership skills. You want to be as well rounded as possible. You can take courses to better your skills as well as get involved in extracurricular activities. You can take courses in public speaking, run a committee or get involved in leadership positions in your local community. Your college professors and employers will be the ones you ask for recommendations on your vet school application, so it is important to build solid relationships with them. You will typically need three letters of recommendation to include with your vet school application. You can let those writing the recommendation letters what areas you'd like them to emphasize, such as animal handling experience, leadership roles, or communication skills. One of these letters should be from a veterinarian that you have worked for, another should be from a science professor, and the third could be from an employer or an additional veterinary contact. Be sure to ask for the letter early to give the writer plenty of time to accommodate your request. 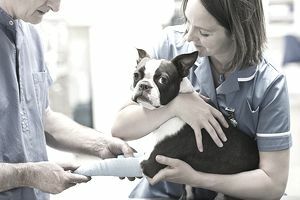 The Veterinary Medical College Application Service (VMCAS), which houses the online application process, only accepts electronically submitted recommendation letters through their Evaluation Portal. It's important to check with the school you're applying to, for the proper method of submitting your letters. You will also need to include a personal statement on your application. Put some serious thought into this statement. It is your one chance to personalize your application and give the acceptance committee a feel for who you are and what you might bring to the veterinary profession. Explain your interest in veterinary medicine and what you have done to prepare yourself for this career. You will need to take the Graduate Record Exam or GRE. There are many GRE prep books with a CD-ROM if you study well on your own, or take a classroom preparation course. Some schools require the Biology GRE in addition to the general GRE. Make sure you have your scores sent to your chosen schools in a timely fashion. When sending in an application, make sure to apply to your state school provided there's a veterinary program in your state. Some states without vet schools have agreements with neighboring states to accept a certain number of students. Your best chance of acceptance will be at an in-state school. Also, be sure to carefully read up on each school's prerequisites to be sure that you meet all the requirements for acceptance. Most schools have similar requirements, but you don't want to be turned away on a technicality. You don't have to be a pre-vet major to get into vet school, but a majority of applicants have a major in a science related field. Science majors generally take most or all of the prerequisite courses as a part of their program. Many U.S. veterinary colleges accept a centralized application from the Veterinary Medical College Application Service (VMCAS). This application is available online and is typically due by September 17th. During the application process, you may be selected for an interview at one or more of your potential schools. Be sure to prepare for this, as you may be subjected to a variety of interview styles. If you don't get in on the first try, don't give up. You can always consider pursuing further education (such as a master's degree), getting licensed as a veterinary technician, or adding more veterinary work experience to your resume before applying again. Get in touch with the schools that turned you down and ask for feedback on what could make you a more attractive candidate in the future.